Growing up in NW Iowa, farming is a part of life – whether you actually grew up on one or not. The towns build around the largest business in them – their Cooperatives. Tractors and manure spreaders are common to be riding down the highways along with the rest of the traffic. You are surrounded by fields of corn and beans, century farms and pastures filled with cattle. And stopping at your local gas station during “coffee time” is always a treat as the farmers all gather to compare stories and hash out the days’ work that is ahead. A man in a Pioneer Seed Corn hat is proof that he has to be a farmer – right? While that is probably very true, God created many different farmers – all with their own gifts and talents – all with a passion to serve others through their day to day work! One such farmer that shares his passion a little differently is Derek Klingenberg – YouTube celebrity, better known as “Farmer Derek”! If there’s one word that sums up Farmer Derek, it would be DIFFERENT! 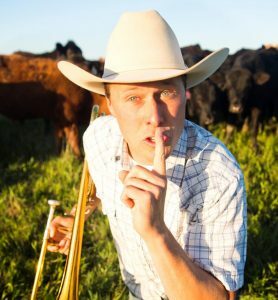 When his grandpa migrated from Prussia in 1923 and settled down on a farm north of Wichita, Kansas, chances are good he had no idea the changes the farm would see or how his grandson would use his talents and out-of-the-box ideas to bring a well-rooted love of farming to a different stage. “I haven’t worked since I graduated from college,” he jokes. For Klingenberg, each day on the farm is an adventure. It starts with the usual tasks that accompany managing a row-crop and cattle operation, which he does with his father, Vernon, and brother Grant. In between feeding cattle, building a barn, and harvesting crops, Klingenberg plays more wholeheartedly than most 4-year-olds. You see…..when you have a PASSION for something, finding JOY in your day to day work can come pretty easily! Yes, there are days that don’t hold as much excitement and can be down right challenging. But by using your gifts and talents, and finding something in each day to be grateful for, the days are filled with new opportunities to serve in one way or another. And when your passions collide, like they have for Farmer Derek, every day is an adventure!! If farming is something you see in your future, remember – there is no cookie cutter description for the question – “what is a farmer”. God has created each and every one of us differently – all with different abilities – all with a different mold. Follow your heart…..follow your dreams….. and watch amazing things happen!! ← Education or Work Experience – What’s More Important?